Lifeboat davits. Electrical, hydraulic and pneumatic winches for various pruposes. Includes Towing/Anchor Handling winches, Single Double drum winches, Tugger winches, Gangway winches. We are a top-notch organization, engaged in providing Boat Davit. Rig davit systems comprise two fixed arms and an electrically powered winch. 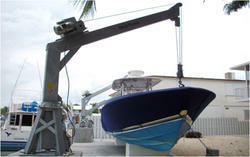 These davits use the weight of the boat to lower it into the water, independent of external power supply. We are amongst the most reputed names in the industry, offering Boat Davit. 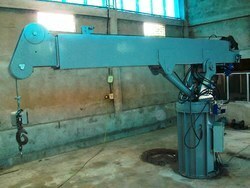 - Single Arm Jib type. We are fascinated in manufacturing and supplying high quality Boat Davits in Mumbai, Maharashtra, India. The offered range is made utilizing of high grade raw materials and cutting-edge technology by our skilled professionals. To guarantee quality, these Boat Davits are thoroughly tested on various parameters. Our customers can easily avail these Boat Davits from us at nominal market prices. We are a top notch supplier of Luffing Type Boat Davit. - Four Piece confined space system with 25 MTR winch and 20 mtr fall arresor block. - Designed for manhole and confined space entry/retrieval and fall arrest applications. Harding’s unique Totally Enclosed Davit concept integrates highly efficient electrical and hydraulic systems into the davit structure providing optimal protection against wear and tear. Rescue boat davits, single arm or A-frame, are freestanding deck mounted davits designed for safe and efficient launching and retrieval of rescue boats, and in some cases liferafts. Banking on our enriched industry experience, we are able to supply Boat Davit. Easy access to components for. Efficient execution of (visual) inspections. Long-term operation under extreme conditions. Deck in welded or bolted version. Free-Fall Davits usually are deck mounted, placed at the stern of the ship, comprise of a launch ramp, bottom frame, and an A- frame to launch and recover the compatible lifeboat. SHM SHIPCARE Sharks Safety (Vizag) Inc.
- Regulation: As per SOLAS requirement. Clients can avail from us high quality range of Hydraulic Pivoting Davit. The PFH davit consist of two davit arms, each supported by a davit stool, cylinders, an electric winch and hydraulic power pack unit. The system is suitable for safe and efficient launching and recovery of a fully manned life / rescue boat and workboats.